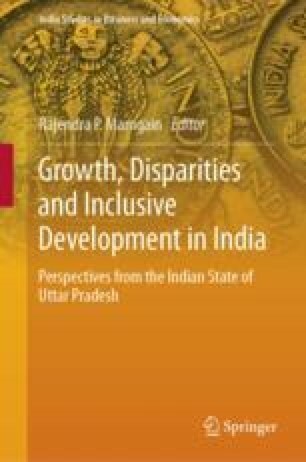 The article questions employment and its quality in one of the least developed states in India, namely Uttar Pradesh, with a focus on gender and social groups. Despite a reasonable growth in Uttar Pradesh, the per capita income in the state is almost half of the national average, and such gap tended to increase over the years. Along with a slow pace of structural transformation, most of the growth in employment opportunities was in the form of casual wage works, mainly in the construction sector of the state. Such high pace of casualization was widespread in all regions of the state except the eastern region where dependence on agriculture did not reduce due to lack of such opportunities. The growth rate in regular employment opportunities in the state was almost three times lower than that at the national level. Uttar Pradesh suffers from a huge deficit of remunerative employment opportunities. A large proportion of those working as casual wage labour and those self-employed in agriculture are located at the bottom 20% quintile of income distribution in the state, and the proportion of such workers in the bottom quintile significantly increased since the early 1990s. The state faces relatively higher challenge of poor employability of its labour force mainly due to low levels of education and poor formal skill training along with slow growth in employment opportunities. Though the state has enormous potential to shift to a development path characterised by remunerative jobs for its increasing labour force both within farm and non-farm sectors, it would require substantial investment supported by active public policy support towards improved access to credit, technology, skill training and market. In brief, the success of a future inclusive growth agenda for Uttar Pradesh would depend on its strategy of promoting investment in employment potential sectors and ensuring equal participation of its people belonging to various regions, gender and social groups. See Annexure Tables 14, 15, 16, 17, 18 and 19. Cuberes, D., & Teignwer, M. (2015). Aggregate effects of gender gaps in the labour market: A quantitative estimate (mimeo). Retrieved on May 5, 2016 from www.marcteignier.com/research_files/GGLMAP_CT.pdf.